This article aims to analyze how science is discursively attached to certain parts of the world and certain “kinds of people,” i.e., how scientific knowledge is culturally connected to the West and to whiteness. In focus is how the power technology of coloniality organizes scientific content in textbooks as well as how science students are met in the classroom. The empirical data consist of Swedish science textbooks. The analysis is guided by three questions: (1) if and how the colonial history of science is described in Swedish textbooks; (2) how history of science is described; (3) how the global South is represented. The analysis focuses on both what is said and what is unsaid, recurrent narratives, and cultural silences. To discuss how coloniality is organizing the idea of science eduation in terms of the science learner, previous studies are considered. The concepts of power/knowledge, epistemic violence, and coloniality are used to analyze how notions of scientific rationality and modernity are deeply entangled with a colonial way of seeing the world. The analysis shows that the colonial legacy of science and technology is not present in the textbooks. More evident is the talk about science as development. I claim that discourses on scientific development block out stories problematizing the violence done in the name of science. Furthermore, drawing on earlier classroom studies, I examine how the power of coloniality organize how students of color are met and taught, e.g., they are seen as in need of moral fostering rather than as scientific literate persons. The quote above is from a Swedish textbook in natural sciences for upper secondary school. It shows that the idea of science is culturally attached to ideas of development and progress. This is not surprising, but rather common sense. A strong social discourse is that research (in almost any field) aims to improve education, health, economic prophecies, and technological standards. Signs of what is conceptualized as a “civilized society” are found in high levels of scientific rationality and technological development; and metaphors of scientific development as “discovery,” “forefront,” and “frontier” culturally attach the practice of science to the making of a better world (Carter 2008, p. 622). However, as we know, every narrative sheds light on certain aspects of the world and hides others. There are noisy discourses, but also cultural silences, constructing certain understandings of what science “is” and what science “does.” Moreover, a certain kind of human seen as “scientifically rational” is culturally made up in relation to the Other (Hacking 1995). This Other is either trusting “irrational things” (such as religion, traditional knowledge, post-truth) or simply not thought of as being subjected to scientific rationality or technological development (at all). Frequently, the latter depends on where the person is situated in the world. The practice of science, and the science-literate person, is thought of as connected to a certain place: the West. This article aims to deconstruct how the practice of science is discursively attached to certain parts of the world and certain “kinds of people”. The focus is on the following: how the history of science is represented in science textbooks, how coloniality as a technology of power organizes the scientific content, and how different categories of science students are understood and met in the science classroom. Commonsensical understandings will be explored and disrupted through illuminating how a specific colonial legacy of science forms the basis for organizing cultural understandings of what science is, and what a science-literate person is (Popkewitz 2008). The analysis starts from a postcolonial theoretical perspective, which means that the article critically scrutinizes how scientific development is culturally “attached” to a certain part of the world and how other parts of the world are simultaneously presented as underdeveloped and lacking research and rational thinking. These geographical places, and their inhabitants, are thereby described as in need of progress. Often, the division between these worlds is conceptualized as the difference between the global North and the global South. However, this conceptualization is in a way misguiding, since it is not only about the geographical location but also about the conceptual understanding of the world (Eckl and Weber 2007). Using binary categories also risk contributing to the making of difference. Hall (1992) shed light on this problem by using the categories of the West and the Rest: the Western norm in which the rest of the world often is reflected—with no room for complexity. Though I recognize the complexity of categorizations, in this text the categories global North and global South are used—not as geographical areas but as cultural constructs (Carter 2010). This also implies that the South and the North, as well as the West and the Rest, of course are not homogeneous in themselves, as well as that Western practices (new age, religion, pseudo-science) are certainly de-attached from the idea of a Western rationality. The article is structured as follows: after an introduction to the theoretical framework, a positioning inside the research field of science education, and notes on the method, I begin with a (very limited) description of how science, modernity, colonialism, and the notion of progress have been—and still are—attached to one another. Thereafter, I dig into noise and silences in Swedish science textbooks in order to show illuminating examples. After that, a discussion follows of how the science-literate person and his/her Other are constructed inside a colonial rationality. The scope of the article is, in other words, quite wide, but my narrow point is that we need to see the different cultural pieces as a whole. The theoretical foundation for my approach is Foucault’s work on discourse and the co-construction of power/knowledge (Foucault 1983, 1991). Power is exercised through making up ways of thinking and talking as scientific or reasonable (Hall 1992): “the reason of reason” as Popkewitz (2008) conceptualized it. Power and knowledge are thus inseparable categories and operate together in the making of truth, as well as (im)possible subjectivities and categorizations of the normal and the deviant (Foucault 1983). Dean (2002) named it the Foucauldian triangle, in which power, truth, and the self are co-produced. These makings of belief systems and humans are not innocent: they act not only upon thinking, acting, and planning but also upon the living conditions of human beings. Hacking (1995) talked about “looping effects,” that is, discursive constructions act on the world in very concrete and material ways. The narratives not only describe science and scientific minds but they also produce ways how we can think, talk, act, and live (Foucault 1991). The ways of how one can live differ depending not only on material living conditions but also on how you are categorized and positioned in the society. Through problematizing and deconstructing the making of science and the science-literate person, the ways we teach and talk about science can be challenged. However, the discourse in the Foucauldian sense not only consists of what is said but also of what is unsaid (Foucault 1969); or as Rodney Carter (2006) puts it: “There is no speech without silence, otherwise there would just be unmodulated cacophony; likewise there would be no silence without speech, just a universal meaningless, emptiness” (p. 223). Everything cannot be said, but we need to scrutinize what stories are missing. What is left out is also a kind of storytelling; and through emphasizing some perspectives, events, and narratives, others becomes hidden, silent, or even unspeakable in a certain context (Billig 1999; Kulick 2005). Certainly, it is often the stories of marginalized groups that are not told, or are told from the perspective of the superior. To deconstruct the power/knowledge exercise, I have turned to literature in postcolonial theory, but also to critical race studies and whiteness studies. An important thinker is Spivak (1988), whose writings concern epistemic violence: an exercise of power through limiting the understanding of valid knowledge. It is noteworthy that Spivak borrowed the concept of epistemic violence from Foucault but, at the same time, criticized him for exercising epistemic violence himself. In her conceptualization of how to understand power, she brings in to view how notions of knowledge, civilization, and education have been used to undermine non-Western methods or approaches to knowledge. By that, she problematizes not only the colonizers’ use of science and technology but also current efforts to provide technology, medicine, and education to the “uncivilized” parts of the world. In these colonial processes, the voice only belongs to that of the colonizers—the ones in power. The subaltern’s voice is not heard (Spivak 1988). Rather, it is silenced through the epistemic violence of not recognizing it as “reasonable,” “rational,” or “scientific” (c.f. Haraway 2004, p. 88). Science and technology have a special place in the discourse on Western rationality, which has been emphasized not least through the writing of the history of science during colonial invasions. For instance, Schiebinger (2009), Harding (2011), and McClintock (2013) have drawn attention to how science, technology, and colonialism are attached to each other and that science and technology even worked as imperial tools to divide and colonize the world. This theme returns in Seth’s (2009) postcolonial readings of science history. The work of McClintock, Harding, Schiebinger, and Seth plays double roles in this text as sources for a background story on science and colonialism, and as theoretical lenses for understanding how the entanglement of science (as knowledge and method) and development are constructing and differing the world. Coloniality is a kind of logic, often expressed in a language of salvation (Shahjahan and Morgan 2016, p. 93), help, or development—and is therefore more difficult to problematize than the violent history of colonialism. Similarily, characteristics such as being knowledgeable and rational are connected to whiteness. Gitz-Johansen (2004) wrote about the construction of the incompetent child (as the competent child’s Other). He stated that the characteristics of the competent child—such as empowerment, rationality, and the competence to make well-informed decisions—are stuck to (in his case “Danish”) white children, while the opposites—religious faith and worldview, traditional values, lack of self-confidence—are culturally attached to racialized, immigrant children: the “other of reason,” to quote Castro-Gomez (2002, p. 276). This is neither something new nor limited to educational settings. Whiteness has for centuries been connected to desirable human qualities such as rationality and beauty, which builds on an imperialistic historical narrative where whiteness is represented as the “light of the world” (Dyer 1993, 1997). Blackness, on the other hand, has represented the unknown, mystery, and danger. The attributes are not necessarily bad; whiteness can for instance also be connected to environmental degradation and blackness to a sense of nature. Nevertheless, this cultural system structures what kinds of people that are attached to what places, as well as how different kinds of people can be acted upon (Ahmed 2010, 2012a; Puwar 2004). As a consequence, the article explores the co-construction of people, places, and practices. How does the cultural imagination of a certain place (global North, global South) attach to a certain practice (science) and certain people (depending on race and nationality) in school science? How can we see these attachments through using the theoretical lenses of epistemic violence and coloniality as a technology of power? During the last decade, the importance of deconstructing the making of scientific facts as a human activity embedded in culture, traditions, material conditions, and human activities has been noted and explored by many scholars. Most often, it is conceptualized as a part of the Nature of Science (NoS) (e.g., Lederman and Abd-El-Khalick 1998; Lederman 2007). Through this perspective, it seems possible to challenge the cultural-historical legacy of science (Carlone 2004): the understanding of science as “cold,” fact-based, and linear. Literature on the nature of science calls for unpacking the black-box of production of scientific data and how they are used in society (Latour and Woolgar 2013). In educational research, the history of science and the societal use and understanding of science are often emphasized. However, this is seldom done from a postcolonial theoretical lens. On the contrary, NoS is often emphasized as a tool to raise interest in science and to make it more useful for society and everyday life (e.g., Allchin 2014; Driver et al. 1996; Aikenhead 2006; Leden 2017). That means that the purpose contributes to the discourse constructing science as important for societal progress—rather than problematizing the culture that it is a part of. To be fair, NoS aims to problematize the culture as well, even though the postcolonial and critical race perspectives are rare. More recently, Erduran (2014) claimed that the colonial heritage of science should be included in the teaching of NoS, in order to increase the complexity of understanding science as a cultural, historical practice. Furthermore, Noblit (2013), as well as Mutegi (2013), encouraged us as researchers to ask how the colonial history and ways of thinking are still a context for current affairs, not least in science education. In other words, emphasizing of indigenous science might reproduce the colonial binaries. Another line of studies in the research field of science education aims to understand connections between race, ethnicity, and achievement in school science, as well as possibilities to continue in the so-called STEM pipeline (e.g., Oakes 1990; Kanter and Konstantopoulos 2010; Brown 2005; Brown et al. 2016) and development of teaching methods to reduce the “achievement gap” (e.g., Barton 2001). There are also studies problematizing the social construction of race and how it acts upon the science learner (e.g., Archer et al. 2015; Pinder and Blackwell 2014). For instance, Walls (2016) pointed, from a literature review, to the fact that the field of NoS research is color-blind (Bonilla-Silva 2013) and that it does not recognize structural racism. Instead, Walls claims that conclusions from NoS research mainly relies on studies on white students—even though they are conceptualized as “just students” (similarly, Western science as “just science”). Earlier studies that raise issues of race and inequalities are important. However, this article differs from them in studying the colonial heritage of science rather than the category of students, even though these two are impossible to separate. As stated above, this article aims to deconstruct how the practice of science is discursively attached to certain parts of the world and certain “kinds of people.” This is done through analyzing a discourse organizing what narratives about science are told, and through deconstructing hegemonic stories that are repeated in the cultural narrative. These I call noisy discourses, since they, in a way, are blocking other stories out. However, as it was above, this article not only studies what is said but also what is left unsaid in the science curriculum. But how do you recognize and study a missing narrative—a silence? Carter (2006) tried to find ways to discover archival silences, that is, what and whose stories are missing in archives: “The pertinent question that arises is how can one “prove the absence of an archive?” Where does one begin to look? How do we begin to look for absences? It is only in the awareness of silence that we can begin to remedy it” (p. 223). Carter was inspired by feminist ways of “listening to silences” and by reading the archives “against the grain” (p. 223 f) in order to see what is there and what is not—the stories that could be powerful counter stories to the hegemony. If we understand science education materials—textbooks, research papers etc.—as a kind of cultural archive telling what science and the scientific literate person are and where they are imagined to be positioned in the world (Ahmed 2012b; Stoler 2010), can we then read against the grain in order to search for what is not there and for how that silence affects what is possible to think, to say, and to do? To capture both the silences and the noisy discourses (and how they interplay), it seems necessary to examine different kinds of sources. Inspired by Marcus’ (1995) notion of multi-sited ethnography, conceptualizing how the researcher follows a question—rather than studying a specific place and time—this study can be described as a multi-sited desk study. It aims to put pieces together and understand and deconstruct how the colonial legacy of science organizes science education of today. Hereby, I draw on Richardson and St Pierre’s (2008) work on writing as a method of inquiry. This means that I try “to find something out” through reading and writing, to draw lines between different sources such as the history of science, science textbooks, and studies of the science learner (Carter 2010). As a consequence, the character of the text is of a theoretical kind, using different resources to shed light on noise and silences when it comes to describing science through a lens of coloniality. It is important to note that I, of course, do not claim to discuss all silences (or noises). Instead, the aim is to use the theoretical framework of coloniality to look for specific stories that are told or untold. The empirical data comes from different kinds of sources. The main data consist of science textbooks used in the Swedish secondary school, because it is at this level that one expects a more complex teaching of the history of science. Furthermore, it is here that colonialism is introduced in the subject of history, in accordance with stipulations in the Swedish curricula (Johansson and Wickman 2012; Leden 2017). I have analyzed ten textbooks from the subjects of biology, physics, chemistry, and “natural sciences” (a school subject for non-science programs in upper secondary school). The books used are listed in Table 1. These books have been explored not only for references to colonialism but also to see how science is attached to certain parts of the world and certain human kinds. Special attention has been given to the chapters addressing NoS in terms of science history and the making of scientific knowledge. Further, one book from history served as a comparison to capture silences in the science discourse. This book, PRIO: Historia (2014), is 608 pages long and published by one of the main companies after the latest curricula reform. Certainly, I could have chosen to look into more history books, but since the aim is not to make a comparative study between history and the science subjects but to use the history book as an analytical tool to look for silences in science teaching, the focus was put on the science textbooks instead. In order to see what is there and what is not there, the analysis of the science textbooks was guided by three themes addressing both noises and silences: (1) if and how the colonial history of science is described in Swedish textbooks; (2) how science history is described; and (3) how the global South is represented. I have searched for narratives on development/progress, the global South, and histories of science and colonialism. Of course, there are other narratives about science and science history, but these are not discussed in this article.3 Quotes are used to illuminate the specific research questions stated above. As can be noted in the analysis below, most quotes used are picked from the biology books. This does not mean that they are “bad”; rather, the opposite seems to be the case, since they at least raise questions about science in the global South—in the present and in the history. The textbooks are thus used to analyze the image of science in relation to both colonialism and coloniality. However, they do not actually say anything about how these discourses are reproduced in the science classroom. Maybe the discourse is challenged, maybe not. And this is of course impossible to generalize. Still, I wonder how the discourse of coloniality is impacting the science class. Without claims about how textbook messages are negotiated in “reality,” I intend to further discuss how this cultural-historical legacy of science is discursively constructing “the science student.” This is done by drawing on previous studies on cultural understandings of different “kinds of” students, with different national origins and different colors of their skins (Ideland et al. 2011; Ideland and Malmberg 2012; Kirchgasler 2017; Mutegi 2013). The question is how the power technology of coloniality affects the idea of “the science student” in terms of race and nationality. Naturally, these studies play a different role than the textbooks in the article, as they are not analyzed as raw data. Instead, the previous studies on the image of the science learner help to analytically draw lines between the practice of science, cultural imaginations of different places, and the “making” of human kinds (Hacking 1995). The purpose is to show how these are aligned inside a discourse of coloniality and to disrupt taken-for-granted understandings, rather than to claim “how it is” (in general) in science classrooms. 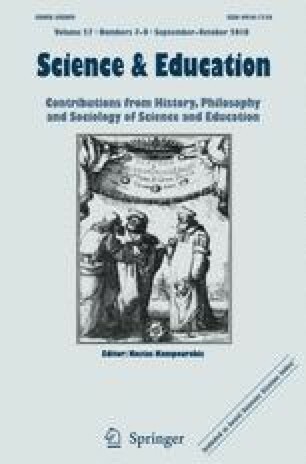 The analysis of the textbooks and the discussion about the notion of the science-literate student are based on readings regarding the relation between science, modernity, and colonialism. Through readings of science history from feminist and postcolonial perspectives, I was able to capture both the noise (the taken-for-granted understanding of science) and the silences (what is established science history, but not brought up in science education). To sum up, through a multi-sited desk study, I draw lines between science history, science textbooks, and studies on science learners in order to provide perspectives on how we tell the history of science effects how we meet and teach students. Before entering the empirical analysis, a background story on science, colonialism, and modernity is presented. This section provides some examples of how science and technology have played important parts in the colonial conquest of the world, and how they still do in efforts to “help” or to civilize. But let us first think of how science, as an idea and a practice, has become such a powerful colonial weapon, not least through narratives of progress and development. I argue that this has to do with the co-development of science, technology, and modern society. With help from postcolonial studies, we can see that modernity and coloniality are two sides of the same coin (Harding 2011; Mignolo 2011; Vázquez 2011; Shahjahan and Morgan 2016), or as Santiago Castro-Gómez (2002) puts it: “Modernity is an alterity-generating machine that, in the name of reason and humanism, excludes from its imaginary the hybridity, multiplicity, ambiguity, and contingency of different forms of life” (p 269). Castro-Gómez (2002, p 277) continued discussing modernity/coloniality by stating that this must be seen as a project governing the social world in a double sense: inwards through the making of national identities in America and Europe, and outwards by ensuring the flow of natural resources from the colonial periphery to the colonizer’s center. McClintock (2013), p.5) went further by suggesting that “imperialism and the invention of race were fundamental aspects of Western, industrial modernity”. This strong connection between industrial (technological) development and colonialism can be illustrated through sociologist Max Weber’s work (in Hobson 2004) on the “great rationality divide.” As Said (1979) has taught us, Orient and Occident worked (and still do) as oppositional terms, so that the Orient was constructed as a negative inversion of Western culture. Weber positioned modernity to the Occident and its opposite, tradition, to the Orient. For instance, the Occident/modernity is described in terms of rational (public) law, rational-legal (and democratic) state, rational science, and protestant ethics and the emergence of the rational individual. Its opposite, the Orient/tradition, is described in terms of ad hoc (private) law, patrimonial (oriental despotic) state, mysticism, repressive religion, and the pre-dominance of the collectivity. Imagined differences between Western science and Orient unreason were—and still are—structuring what is considered as “knowledge” respectively “myths.” They also organize understandings of which bodies (in terms of race and nationality) that are culturally attached to ideas of being scientific, versus un-scientific, modern versus traditional (see also Latour 1987). Taking Weber’s perspective on the Occident and the Orient, the West and the Rest, the North and the South, it might seem natural that science and technology were considered as “gifts” brought by the imperial powers to the colonies. They were a part of the “helping” and the civilizing mission (Seth 2009, p. 373). But “help” can be seen as an imperial act exercising epistemic violence (Spivak 1988) and making up differences between “human kinds” (Hacking 1995). Science was used as a tool to conquer the world, at the same time as the science and technologies developing in and through the colonies were crucial for the developments of the West (McClintock 2013; Harrison 2010). Medicine, for instance, became a “tool of the empire” (Headrick in Seth 2009, 373f). Medical experimentations on patients in the colonies were crucial for medical development, as well as for chemical and botanical discoveries (Harrison 2010). Likewise, colonial botany became a way of categorizing and organizing “the undiscovered world.” From a Swedish point of view (where I stand), the work of Linnaeus, the “father of modern systematics,” on taxonomies and naming of plants was a part of the civilization project to make the plants more “European” by changing the foreign plants’ “barbarous” names into systematic categorizations in Latin (Schiebinger 2009, p. 194 ff). In addition, exhibiting tropical plants at museums and the like was a way to show “ownership” of the plants as well as the land (Erduran 2014). Furthermore, colonialism made possible the exploration and cultivation of profitable plants needed in the West; here again, Linnaeus was one of the major figures in these efforts. Colonial botany was not only about exploration but also about big business (Schiebinger 2009). Darwin’s discoveries were also dependent on the Empire. Later, his theories were used to legitimize racialized practices—treating humans in the colonies as well as “at home” (Hübinette and Lundström 2011). The Swedish Institute of Race Biology is an example of a colonial rationality and of social Darwinism, one with horrible effects on both individual and societal levels (Broberg and Roll-Hansen 1996). An example of this was the state-sanctioned eugenic sterilization program, which ended as late as the 1970s in Sweden (Tydén 2010). In this political project, up to 63,000 people were forced to sterilization. The aim was to improve Sweden’s racial hygiene. Examples of groups sterilized were people with mental disorders, but also with unwanted behaviors such as promiscuity or being asocial. The grounds for sterilization were calculated by the abovementioned institute of race biology. In addition, the taxonomies of plants and the race biology programs were based on the systematization of biology—and expressions of the modernity’s beliefs in taxonomies and rationalities (Latour 1987). However, the colonial sciences were not limited to biology. For instance, the development of the telegraph was an important tool in the colonial administration (Seth 2009; Erduran 2014). These are just some examples of how science, modernity, and colonialism were co-constituted and dependent on each other. Science was dependent on the colonial actions, and vice versa. This image of science as “helping” the underdeveloped world is still organizing many practices. Let me mention a couple of examples to illustrate the historical threads. Compared to the building of a telegraph system (in order to help the colonizers to communicate), Bill and Melinda Gate’s foundation provides mobile phones to underdeveloped countries. A good gesture, of course; nevertheless, it is also a pre-requisite for people in the global South to become parts of a globalized economy and to use certain brands of digital devices. Western medicine is often described as ready to help poor countries during, for instance, an Ebola epidemic. The headline of a feature article is symbolic: How researchers rose to the challenge of Ebola, accompanied by pictures of white researchers helping black children and the black adults crying for help (Times Higher Education 2017-03-23). Even though the aid and help are important, the power hierarchies between Western scientific frontiers and vulnerable Africans are reproduced over and over again. With reference to Ahmed (2010), different bodies (in terms of, e.g., race and nationality) are stuck to very different cultural characteristics inside the power technology of coloniality. The recurrent, well-known narratives and pictures from these projects mark white, Western people as not only rational but also as democratic and helping, while the Other—the racialized person—is in need of help. This means, as Popkewitz and Martins (2013, p 45) wrote, that a kind of European exceptionalism is made up, allowing the European to look “to the rest of the world as a neighborhood to be acted on”. The insight of colonial history of science is not new; neither is the connection to modernity. However, we need to ask how this discourse is organizing science education and the understanding of the science learner. This section focuses on Swedish science textbooks for secondary school. Since there has been an increased curriculum interest in and demands for raising questions about NoS, it is not surprising that most textbooks include both a science history chapter and a chapter on the scientific method. However, I can already state that only a very limited narrative of science and its history exist throughout these chapters. Certainly, curricular content is always a question of selection. But what selection is adopted, and how does it correspond to or challenge the colonial narrative described above? The analytical questions are as stated above: (1) if and how the colonial, violent history of science is described; (2) how science history is represented and; (3) how the global South is represented—scientifically or as an object for scientific explorations and development. Departing from these questions, raised by the reading of science history through a postcolonial lens, I argue that a noisy progress discourse shadows and silences the colonial history and the postcolonial present. Here, the story is written through a white man who discovered something. The discovery is positioned in a “free country” (not a colony, even though one can really question what the USA was and how this affected the indigenous population). Oil production is then described in terms of the development of gas, industry, and plastics, and as important for society. Problems with pollution are addressed, but not the horrible tragedies that extraction has caused in terms of political disasters and human suffering—neither in history nor today. In a way, this style of reasoning around the colonial past of science confirms the progress of the West, and it tries to leave the colonial injustices and horrible practices in the name of science behind. The history of science, combined with a narrative of progress, displaces rather than engages in the dark sides of science. In another school subject, history, the colonialism is, on the other hand, visible—at least from a textbook analysis. In the textbook PRIO: Historia (2014), there is a whole chapter about colonialism, and the violence is described in detail, as well as the capitalistic and developmental reasons for Europeans’ “conquering of the world” (p 298 ff). Further, the use of infrastructure and medical aid as a way to legitimize violence, as well as imperialism, are noted (p 299 ff); likewise, in the shape of Darwinism, is the use of the scientization of differences between people (p 345). Overall, quite a large part of the book (p. 343 ff) is dedicated to discussing how racism and science (Darwinism, genetics) have been entangled. Even the Swedish science icon Linneaus and his categorization of people are questioned (p. 456), which can be compared to how he is represented in biology textbooks (see below). How can we understand that these questions are raised in history, but barely in science? Is it the progress narrative shadowing the critical questions inside science education discourse? The question of the silence around the colonial story of science must be understood through looking at how science and its history are described. Of course, there is a range of ways for doing this; but through an analysis of the science history chapters in science textbooks, a specific genre is easy to see: scientific discoveries and development are described through individual scientists. What is more, the stories are mainly built around a few white men from the global North: Antoine van Leewenhoek’s development of the microscope, Charles Darwin’s evolutionary theory, Alexander Fleming’s discovery of penicillin, and Dmitrij Ivanov Mendelejev’s systematization of elements into a periodical system. As the books are Swedish, eminent Swedish scientists—such as Carl Linnaeus, Anders Celsius, Gustav von Platen, and Alfred Nobel—are also described as important for the scientific knowledge of today as well as throughout history, all of which is presented in a language of “discoveries” and game-changing inventions. The gender perspective has been emphasized over the past years of Swedish debate on representations in textbooks, and some female scientists (most often Marie Curie, but also the alchemist Maria from Alexandria and Lise Meitner, who worked on early atomic fission) represent scientific progress. However, the geographical representation is still limited to the global North. The only discoveries that are positioned outside the global North are those from Ancient Egypt and China and their abilities to produce gold and paper (PULS: Kemi 2011, p. 18f; p. 164). These examples disturb the otherwise hegemonic genre of discoveries made in the global North, mainly by white male scientists. Furthermore, the ways the discoveries and progress are described are organized by the idea of rationality and systematization. For instance, Linnaeus is presented in a biology book in over two pages under the headline Linnaeus ordered plants and animals (Puls: Biologi 2011, p. 18). His life and work is not, as in Londa Schiebinger’s (2009) book Plants and Empire, described in terms of a colonial, economic project: “One could, however, see the rise of Linnaean systematics also as a form of what some botanists have called “linguistic imperialism,” a politics of naming that accompanied and promoted European global expansion and colonization” (Schiebinger 2009, p. 195). These two quotes neatly illustrate noisy discourses and silences that organize the science education textbooks. The colonial history of Linnaeus and the effects that his systematization of plants, animals—but also humans—had are totally silenced. Instead, the modern, systematic way of ordering the world is emphasized, as well as Linnaeus’ greatness as a person. The second quote clearly gives Linnaeus agency when it comes to scientific progress (he even built the greenhouses himself), while the exotic seeds, plants… just came to Uppsala. Just like people from “all over the world,” which most likely means the West, and not the Rest. The biology book is trying to emphasize global collaboration, which, of course, is an important aspect of Nature of Science. On the other hand, the limits of this “global” collaboration are not recognized. Taking the last sentence seriously, we can look into what “the world” means in this description. Nobel laureates most often originate from and work in the global North (with the exception of prizewinners in literature and peace). However, these differences are hidden behind words such as global collaboration. Moreover, one can question if globalization and global collaboration really is challenging colonial structures. Or is it another expression of the same, as Noblit (2013) claimed: “To play out the analogy, globalization is colonialism repeated. It is both an economic and political arrangement that places the values and desires of one set of beliefs above the values and desires of other sets of beliefs” (p. 242). Globalization, and the emphasis on science as a universal lingua franca, is also a kind of epistemic violence making up what is science and what is not. It legitimizes imperialist actions, such as educational aid and export of technological solutions. In textbooks, this is evident in relation to sustainability issues. Following the logic described above, with discoveries in the West also the solutions to sustainability, problems are described in terms of technological development from the global North (Ideland and Malmberg 2014). However, the problems with sustainability—with close connections between poverty, environmental degradation, security, and bad health—are positioned in the global South (Spektrum: Biologi; PULS: Biologi; Naturkunskap 1b, Naturkunskap 1a1 Frank Blå; Spektrum: Kemi; PULS: Kemi). Once again, this becomes a justification for the global North to teach and to foster the global South into better environmental behavior—even though the problem is most likely caused by the North. The great rationality divide calls for the exercise of epistemic violence—in the name of improving society. This leads us to the question of how the global South is actually represented in textbooks. The positioning of environmental problems, and respective solutions, is quite representative. Problems are found in the global South and solutions come from the global North. For instance, severe diseases are most often positioned in the South. The textbook Makro: Biologi (2010, p. 64 f) has a whole section on malaria, illustrated by pictures of black people in African clothes. Another section teaches about flu from Asia (p. 254 f). The similarities with the media reporting on Ebola discussed above is striking: illness is culturally attached to colored bodies situated in the global South and help is coming from science in the global North. Through these recurrent narratives, different parts of the world and their inhabitants are culturally constructed in different ways—making up an Us and the Other. It is important to note that the representations of the global South are not necessarily negative in themselves. Quite the opposite, sometimes they talk about the lack of technological development in positive ways, such as in an older version of a biology book: “It is often said that we who live in modern communities have distanced ourselves from nature to an extent that we no longer understand how it works” (Spektrum: Biologi 2013, p. 180). However, positive attributes for the global south also contribute to the construction of the Other. The recurrent making of difference and the reproduction of the “great rationality divide” are impregnating the idea of science and development and are fostering the students into a colonial gaze of the world. This is, of course, true, but the representation still strengthens the dichotomy between the underdeveloped South and the developed North, as does the last example of the context in which the South is represented in the textbooks: as natural resources. In Spektrum: Kemi, both oil (2013, p. 253) and rubber (p 293) are brought up as examples of important raw materials, in addition to how they are refined. The point of bringing this up is not to deny that oil and rubber are extracted in the South, but rather that the South, once again, is connected to the less developed, not as refinements or as progress—either when it comes to humans, science, or materials. That is the narrative of the South. No other stories are told. Thus far, the argument of the article has been that the content of school science must be understood from a historical legacy, not only concerning discoveries, traditions, methods, and expectations, but also from the power technology of coloniality. My last question concerns what this means for the practice of science teaching—not only when it comes to the content, but also to how the science learner is culturally made up and met. Drawing on, for instance Ladson-Billings (1998), Ahmed (2010), and Puwar (2004), the purpose is to discuss how certain characteristics are culturally attached to certain people and to certain parts of the world, and how this making of different kinds of people conditions different possibilities (Hacking 1995). In this specific case, how is the “great rationality divide,” present in textbooks, influencing science teaching? Do the cultural ideas of the developed global North and the underdeveloped global South affect the understanding of different categories of students? It is important to note that this is not an analysis of students’ perceptions. Even though I have discussed white male scientists and the very limited representations of the South in the section above, my aim here is not to look at studies on the perception of science depending on gender, race, nationality, etc. Instead, I discuss how science and coloniality as technologies of power not only shape the images of the world and of science but also how science teaching is organized for different student groups—often under the slogan that science is for all (Noblit 2013). For this discussion, I turn to earlier studies from Swedish and American contexts—not because they give a full picture on how it “is” in the science classroom, but because they help us to further understand the problem explored in this article; how the discourse of coloniality is not only about textbook representations but having effect on the life of students. In science education, I would claim that this disciplinary power is exercised through the language and power of scientific knowledge. In a Swedish study on implementing work with socio-scientific issues about health, it was clear that teachers organized the teaching depending on the social category of students (Ideland et al. 2011; Ideland and Malmberg 2012). While white, “Swedish” students in a middle-class residential area were expected to work scientifically and to stick to the science facts (which was not the purpose of the socio-scientific work) in order to get good grades, the immigrant students living in a socially deprived area were not even expected to work scientifically. Instead, the teacher interpreted the main purpose of the socio-scientific work as an opportunity to discipline the students’ behavior—teaching them to eat properly, exercise, sleep at the right time. It seemed like the students’ broken Swedish language, their culture, the place they lived in, and the color of their skin made them up as a certain kind of science students in need of help with and moral fostering in and through scientific knowledge, whereas the middle-class white students were attached to an idea of studying scientific aspects, rather than moral issues. The expectations on the student groups differed, which steered the teaching (Ideland et al. 2011). On the other hand, the students in the multicultural school tried to challenge the expectations as well as the ways of teaching through resistance against the discourses of Otherness (Ideland and Malmberg 2012). In a doctoral dissertation about how the notion of the scientific literate person can be understood historically in an American context, Kirchgasler (manuscript; 2017) writes about how different “needs” are connected to different categories of students in state curricula documents: “Bringing ‘low-performing at-risk groups’ up to benchmark is stated as a national priority, but one that should not compromise the higher goals set for ‘our future innovators’” (Kirchgasler 2017, p. 15). Who belongs to the future innovator and to the at-risk groups are, according to Kirchgasler, following racial and socioeconomic lines. This social construction of categories of students must, asserts Kirchgasler, historically be understood in terms of the making of citizens, saving society through the fostering and changing of (certain) lives, not meeting the norm. What is also interesting is how science is the way to correct bad habits, to civilize, and “Science classrooms emerged as a key site for this transformation” (Kirchgasler 2017, p. 3). Justified by scientific reason, students’ attachment to a “somewhere else” (compared to the West/Global North) are made up as objects for change, in order to be saved and also to protect society from (Popkewitz 2008). I claim that this difference in how we consider different students, which contributes to further stigmatization of already stigmatized groups in society, is strengthened by the way we talk about science and technology, and different parts of the world. The noisy discourse here is that racialized students are in need of development and a more rational way of living. The silence, on the other hand, is that the science class is organized by discourses on race, but also place—students’ skin color and national origin construct them as either belonging to the sphere of rationality or the “Other of reason”. Problems connected to these categories of students are seldom recognized in relation to the power technology of coloniality, and never in relation to how science as a subject is organized by the same discourse. Drawing on Ahmed (2012a) and Puwar (2004), the question must be asked if students of color and/or a different ethnicity than the normative population, ever could pass as “reasonable people,” no matter how scientific literate they were. The power of coloniality and the cultural attachments of whiteness respectively blackness (in a wide sense) will still mark them as the Other. To sum up, the role of science in the European colonial project of conquering the world is not present in Swedish science textbooks. Instead, the discourse of science as a rational Western way of thinking and acting is reproduced side by side with a narrative of the global South as underdeveloped. In other words, colonialism is, more or less, not present in science textbooks, while coloniality as a power mechanism, a discourse, organizes the content. These narratives may not be false; but they are hiding other stories about the North and the South, the West, and the Rest. They represent a selective truth. This means that even though the science textbooks afford an unpacking of the history, culture, and practice of science, the narrative is very limited. I even claim that the unpacking of the production of scientific knowledge (contemporary and historically) is, in fact, reproducing a colonial gaze on the world (Erduran 2014). The efforts to present a positive image of science downplay the violence done in the name of civilization—both as physical and epistemic violence (Spivak 1988). This is most likely done unintentionally, but the story about the darker sides of science is drowned out by a hegemonic discourse of progress, development, and the great rationality divide. Drawing on earlier studies, it is clear that the power of coloniality and the great rationality divide risk to affect how science students are culturally constructed and scientifically taught depending on their race and national origin. Earlier studies points to how immigrant students and students of color—in the USA as well as in Sweden—are seen as in need of changing their behavior into a more scientifically rational (and moral) way of living. They are seen as in need of development—just as the global South. This construction of the “Other of reason” (Castro-Gómez 2002) in the science class is one effect of the cultural connections made between scientific practices, certain places, and kinds of people. My point is that we cannot escape the power of coloniality in science education as long as we connect science to progress, white researchers, and the global North. We need to question those commonsensical understandings of science, of different parts of the world, and of people with different origins and skin. We need to dare to tell the dark story of science to be able to disrupt the idea of the great rationality divide. All excerpts from textbooks are translated by me. I do not claim that these books are fully representative for all textbooks used in school. To claim “this is how it is,” is neither my aim. The study focuses on discourses organizing what is possible to think, say, and do rather than claiming that there are objective truths about what is being taught and not. This methodological approach means that the texts about colonial history, science history, and global South have not been analyzed on a linguistic level (which of course could have been a possibility). Rather, the analysis targeted longer sections, narratives, and its content—what is said and not on the three different themes. The sections were marked and closely read from the perspectives on how persons, practices, and places were described and interrelated in the texts, and scrutinized through the lens of coloniality. I would like to thank the reviewers, the research group SISEME, David Wagner, Paola Valero, Tom Popkewitz, and Magnus Erlandsson for helpful comments on the manuscript. Thanks also to Katie Kirchgasler for sharing her dissertation manuscript with me. The study has been funded by faculty. Times Higher Education 2017-03-23. How researchers rose to the challenge of Ebola. By Hillary Lamb. https://www.timeshighereducation.com/features/how-researchers-rose-to-the-challenge-of-ebola (Retrieved 2017-11-09).